As the main way people often get into their home, a broken garage door can be a major hassle. Don’t let this problem get you down. 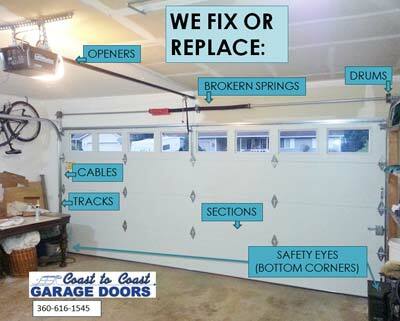 Coast to Coast Garage Doors is the premier garage door repair in Vancouver WA. Our locally owned and operated business takes the time to get each garage door repair done right. We make sure to locate the problem before doing any work. At times it can be as simple as lubricating some of the parts. Our guarantee to you is to keep our prices as low as possible. If the repair is a simple fix, we will never do work that is unnecessary and we won’t charge for more work than is needed. 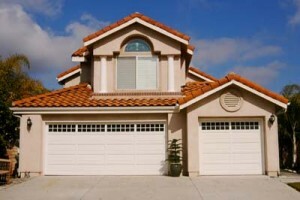 Coast to Coast Garage Doors has been a trusted name in Garage Door repair since 2009. We guarantee our work is done right the first time. We don’t leave until the garage door repair is complete. Our repair vehicles are fully stocked with anything our technicians needs to finish each repair to completion. We avoid having to make you wait while we order parts. That dedication to our work, as well as our upfront pricing and excellent customer service, has made us the go-to garage door repair company in Vancouver WA. Check out our excellent reviews on Angieslist.com and our A rating with the Better Business Bureau. For us customer satisfaction is key. That is why so many of our customers come from word-of-mouth referrals and repeat customers. We stick around to make sure everything works, you know how to use your garage door opener, and you are completely satisfied with our work. Call for a free estimate >> on your garage door repair in Vancouver WA today.